Here's one of my Christmas presents. but to learn more about Julia Child. I ordered her book from the interlibrary loan system. I'LL be doing this weekend!! I also brought this book home. Don't you think I'll be inspired by looking at these knits? It looks very much like a quilt book...hmmmm. This one's been checked out by "yours truly"
That fits me to a "T". Do you think I'll learn anything from this one??? I can sure use the help!!! You probably knew what they were. I spelled it out for you. I didn't lose any points on this one!! I still want a few brownie points for doing it! truth be told...I don't usually worry about it too much. It is a small one. And I did have those little triangle papers. I really DO need to slow down! adding it as an appliqued tag afterwards. I'm adding this to sew and tell friday! I'd begin with this simple block. What can I do with four? And how, you may ask, did you get your blocks to be so perfect? I had a little (lot of) help. Triangles on a roll come in real handy. I put two pieces of fabric together. Lay that handy paper on top. I know I never would have tried these on my own. But they were a gift. Now here's the real trick! The really good Hot tip! Hold that edge on the left and RIP the paper off! This little piece comes right off! I'm OFF to make some more! While I did that this little friend helped out! She's probably my best friend in the kitchen. Put those meatballs in the crockpot with the sauce. serve on rolls with melted cheese. Did you notice there's not much bread? I forgot to take a picture until we'd already started eating. Let me get a picture!!! I almost didn't make it! Baseball season has arrived for these two. They are both playing "challenger baseball". utilize the little league boys as "buddies" for their games. have their games usually beforehand. And I've been to a lot! My two little ones here LOVE it! As you can see, I have two teams represented. And today it was TWO picture times. I had a little break between the two times. Guess what's right down the street? And, I really needed some sanity! So, I drove down the street to my local sewing machine shop. All the fabric was 50% off! There was quite a bit to choose from. sanity that fabric brings me! I see some baby quilts in my future here! that's been hanging in the shop for a while now. I can begin cutting into that lovely fabric. I was reminded again today why I love to blog. Why do I take pictures and blab about quilting?? Well, there are just so many nice people out there! It makes life so much sweeter! Joan e-mailed Ann and Ann gave me lots of great info. Boutonniere or Six Point Flower Garden. The hexagon template fits in the middle there. Now, WHEN will I get around to putting this together? I'm going to hang out here some more! Thank you Joan and Ann. Here's a whole set of pretty things that are so practical!! I have a little quilt treasure that lives at my house. someone who thought I might like them. As you can see there are a whole bunch!! I don't know anything about these little guys. I don't know who made them. I don't know the name of the block. I have never seen a quilt using this design. and a template because most of them are unfinished. Can you cure my curiousity today?? You can see some more creative spaces here. Here's a little dress that I really like. I've always loved brown and pink. And, it does look great on my little girl. The hem was basically a serged or zigzagged line along the bottom. When it came out, I wondered how I was going to fix it. in my overflowing fabric cupboard. I cut a few strips 1 1/2" wide. sewed that on the back side. This is where my quilting skills come in handy. Rolled it over and top stitched it down. Then, I thought I'd share with you a simple trick. there's a trap door under there!!!? I was contemplating taking the WHOLE bottom piece off to clean the lint. Who knew there was little door there??? the BIG sewing machine OPERATION I was going to attempt! told me there was a lot of lint farther back! V over at Bumble Beans is collecting! How many houses do you think she'll get? so I may have to keep that in my orphan block drawer. She said we could use any color. I thought I was supposed to use the same colors! I've decided that important jobs belong to someone else. I'm forever missing those little details! 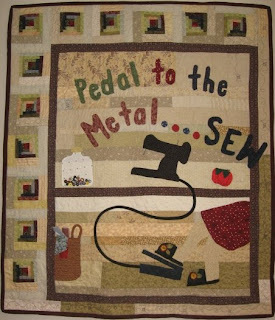 I think that's why I like quilting so much! If I make a mistake....I can just go with it! for my Liberated Amish quilt. I'm now going to think about borders and words!